The FDA has approved a new weight loss procedure that does not require any surgery. It consists of placing a balloon (in this case a double balloon) into the stomach using an endoscope while the patient is sedated. The balloon is inflated during the endoscopy and then detached from the scope. It is an outpatient procedure, takes about 30 minutes, and has very low risk. 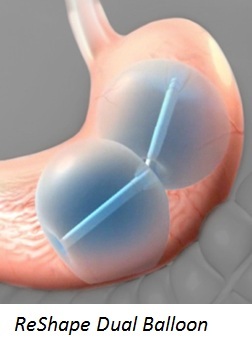 The balloon is left is place for six months during which weight loss occurs because the feeling of fullness and satiety are achieved with less food intake. Achieving the best results involves maintenance of a good dietary plan, along with close medical and dietary supervision before, during, and after the balloon is placed. Read more about this press release here. Paul B Wizman MD PA – Bariatrix Florida has a Metabolic and Bariatric Surgery Accreditation and Quality Improvement Program distinction. We specialize in laparoscopic weight loss surgery options including gastric bypass, gastric sleeve, Lap Band® adjustable gastric band system as well as revisional bariatric surgery. Bariatrix Florida takes a comprehensive surgical approach to treating obesity consisting of comprehensive pre-operative education, nutritional counseling, and ongoing postoperative support. Copyright © 2019 Bariatrix Florida – Paul B Wizman MD, PA. All rights reserved.